London Irish secured a European Challenge Cup quarter-final spot after overcoming French Top 14 side Agen. Tries from Luke Narraway, Tom Fowlie and Tom Smallbone put Irish 19-10 up at the break, with Agen responding through a Filipo Nakosi try and Francois Bouvier kick. Jalil Narjissi then crossed to get the hosts back to within two points. Fergus Mulchrone's effort and a penalty try completed the visitors' bonus-point win to finish second in the group. Grenoble's triumph over Edinburgh was enough to help the Londoners progress as one of the three highest ranked runners-up in the group stage. 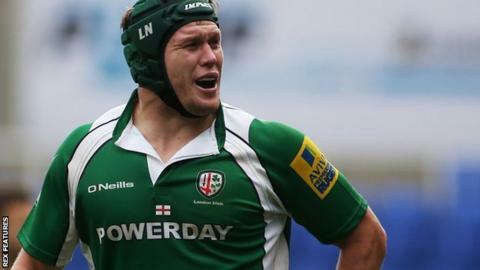 Even with passage to the next stage in Europe at stake, London Irish head coach Tom Coventry has used the competition to rotate his squad, with only eight players featuring in each of the last three games, dating back to their Premiership win against Newcastle on 10 January. Despite the changes, London Irish become the fourth Premiership side to reach the last eight, with Harlequins going through as top seeds, while title holders Gloucester are the only ones with an unblemished record. Agen: Sicart; Tardieu, Roux, Heriteau, Nakosi; Bouvier, Abadie (capt); Tetrashvili, Barthomeuf, Joly, Naikatini, Roidot, Marchois, Bastien, Miquel. Replacements: Narjissi, Bethune, Ryan, Braendlin, Gal, Darbo, Fouyssac, Mchedlidze. London Irish: Brophy-Clews; Ojo (capt), Mulchrone, Waldouck, Fowlie; Geraghty, Steele; Smallbone, Cruse, Halavatau, Curry, Sisi, Narraway, Gilsenan, Guest. Replacements: Ellis, Harris, Aulika, McCusker, Symons, Allinson, Murphy, Lewington.